Black-eyed peas traveled to the Americas and the Caribbean with slaves from their home in Africa. They are one of the world's most widely-eaten peas, according to the Centers for Disease Control and Prevention. Also known as cowpeas, black-eyed peas are nutritious and cook faster than many other bean varieties. These fat-free peas add fiber and protein to your diet without cholesterol. Sort dried black eyed peas by hand to remove agricultural waste products, such as small rocks or leaves. Discard peas that have extremely wrinkled skins or visible blotches. Rinse peas in cool water before cooking to clean them of any residue from packaging. Put 1 lb. of dried peas in a 4-qt. stock pot. Cover peas with 6 cups of hot water. Add salt and pepper to taste, along with seasonings if desired. Cover the pot and reduce the heat to simmer. Cook peas for 45 minutes to 1 hour until tender. Put peas in the pressure cooker with your preferred seasonings. Cover peas with water up to 1/3 of the volume of the pressure cooker. Add 1 tbsp. of vegetable oil to reduce foaming. Cook peas for 15 to 20 minutes, depending on the level of pressure. 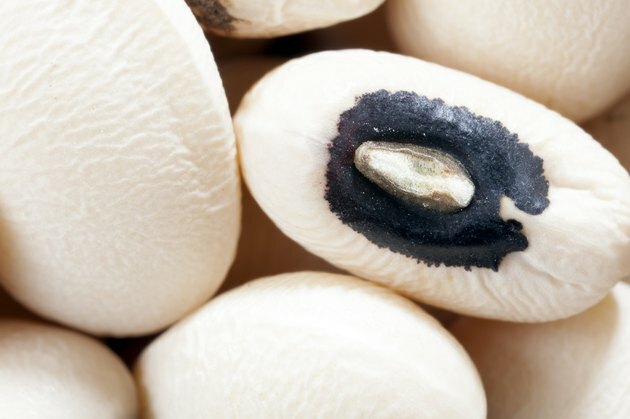 Unlike other legumes, black eyed peas do not require presoaking. In traditional Southern cooking methods, smoked or cured meats such as ham hocks are added for seasoning. Cooking peas in broth instead of water adds flavor and makes a healthier dish than smoked meat. Hoppin’ John -- black eyed peas combined with rice -- makes a complete protein, while peas alone do not. Be careful not to overcook black eyed peas. They become mushy if left on the fire after they are done.